Region: 60 miles south of NYC, 60 miles east of Philadelphia, and 60 miles north of Atlantic City and 20 miles from "Six Flags Great Adventure" theme park. We are 40 miles south of Newark Airport and our town is accessible by car, bus or train. 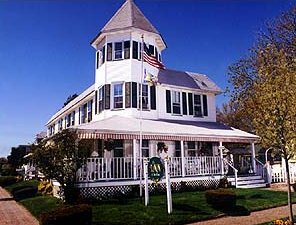 Enchanting 1880 Victorian seaside country inn bed & breakfast. Cozy "Home away from home". Angels, antiques, fieldstone fireplace, spacious common rooms, expansive wrap-around porch, cafe-style brick patio with barbecue, aquarium guest kitchenette are waiting for you. We offer a generous breakfast with a hot dish like sunrise pancakes with vanilla cream syrup and breakfast meats, home baked muffins, fresh fruits, cereals and Tom's granola. The bed and breakfast is steps away from the beach, boardwalk, playgrounds and Silver Lake. Children are welcome. Rooms are air conditioned. Amenities include TV/VCR,porch,modem phones, inroom fireplaces and whirlpool tubs, afternoon beverages, bikes and beach passes. We have 11 rooms. Four with private baths some with whirlpool tubs and fireplaces and six that share three bathrooms in the hall. Our prices range from $145 to $295 and we accept Visa, Mastercard and American Express. Featured in AAA & Mobil Guidebooks. We are open year round, do not permit pets, allow smoking only on the porch, have conference facilities for 45 people and are not wheelchair accessible. Area activities include ocean beach, boardwalk, tennis, golf, playhouse, race track, antiquing, birding, biking, fishing, sailing and historic villages. Only 20 miles from Six Flags Great Adventure Theme Park! This and other Belmar Bed and Breakfast Inns can be found here in The Register.